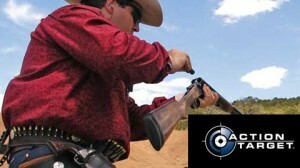 Founder’s Ranch, New Mexico – Action Target announces the Single Action Shooting Society (SASS) has made them the official target manufacturer for their group of Cowboy Action Shooting (CAS) enthusiasts. This announcement runs in tandem with Action Target being named the official target manufacturer for the world’s largest single action shooting competition, End of Trail. Action Target has been working with SASS for many years. Their targets have been used with increasing frequency at regional, state and club shooting matches. They have also been the preferred choice for various other CAS events. This prompted Action Target to work with SASS World Champion Evil Roy (aka: Gene Pearcey) to develop the industry’s most portable, economical, durable and independently reviewed steel target, the Evil Roy Practice Target. The Evil Roy target has been through some of the most grueling and comprehensive torture tests, but it performs each and every time. Some of the most respected independent reviewers in the industry, such as Nutnfancy, that have the consumer in mind, have tested and evaluated the Evil Roy. Evil Roy has been instrumental in the creation of the target named after him. He has also been working with SASS in the development of rules, shooting stages and weapon characteristics to include Wild Bunch Action Shooting, which will be the opening stages of the 2011 End of Trail. The End of Trail Main Match will take place Thursday, June 23rd through Saturday, June 25th. The competitors participate in twelve individual stages shooting four stages per day Thursday, Friday and Saturday. End of Trail is a four gun event. That is, the shootist is required to perform using two six-guns, rifle and shotgun in each of the main match stages. Shooters can expect to fire ten pistol, up to ten rifle and up to six shotgun rounds for each stage and should be prepared to bring enough ammunition for the warm up and main matches. For more information on SASS, the End of Trail or Wild Bunch Action Shooting, please contact Lamar “Coyote Calhoun” Shelnutt or Misty “Misty Moonshine” Miller at (505) 843-1320. For more information on Action Target’s line of Cowboy Action Shooting Targets, their variety of Portable Steel Targets, or their full line of products and services visit their website, www.actiontarget.com. To purchase Action Target products for drop shipment direct to your U.S. range or facility, shop online at www.shopactiontarget.com. For other shooting and range-related needs, visit the Action Target subsidiary, Law Enforcement Targets. Next articleBrownells Adds Ammo, Takes The Shopping Experience To The Next Level!